A while ago, I made a short book from a series of lectures our Dad gave shortly before he retired as a Methodist minister. He’s a fantastic deep thinker and theological historian, and a great writer too. The book really deserves better distribution. So I’ve built Cingela as a platform for his book, as well as some other things he’s doing now that he’s retired. You can buy the ebook edition for Kindle or any other major ereader there. 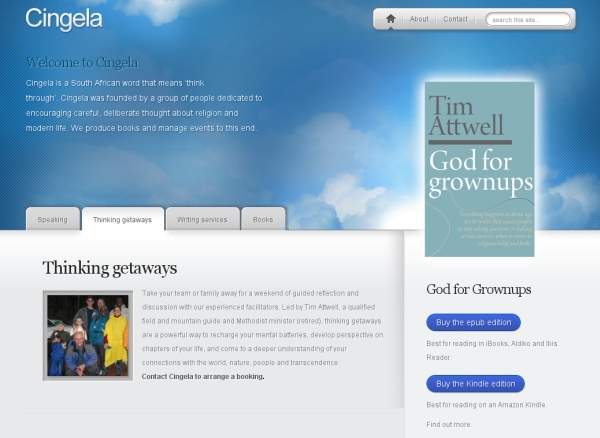 There may be other books published under the Cingela banner later this year, so they’ll be sold there too. The site explains what ‘Cingela’ means, but you’ll have to watch this week’s video for the correct pronunciation. Hint: it’s a one-click site. Haha. Anyway. Tools used: The site has a WordPress CMS with the MyProduct theme from Elegant Themes. Photos are my Dad’s. I used Photoshop (at the office) or The GIMP (at home) for tweaking the images, like creating the glow around the featured-book cover image. For selling ebooks, I’m using Payloadz with PayPal. Process: Register domain (we use Hetzner); install WordPress; download, install and set up the theme; set up an account on Payloadz.com (for delivering downloadable ebooks), link it to Paypal, and create and upload the ebooks on Payloadz; create a site logo; find photos; write page copy; go through everything with Dad and make a few changes to text. Probably about five hours’ work spread over several days. This entry was posted in Arthur, The sites by Arthur. Bookmark the permalink.